More than 12 million visitors contributed $3.5 billion to the Montana economy in 2016 while visitation as a whole was up 5 percent, according to new figures released by the Institute for Tourism and Recreation Research at the University of Montana. Released this week, the figures found that visitor spending directly supported nearly $2.9 billion in economic activity across the state and supported more than 41,000 state jobs. Nonresident travelers also indirectly supported an additional $2 billion in economic activity and more than 15,000 additional jobs, according to Kara Grau, the institute’s assistant director of economic analysis. Travel groups spent $148.40 per day on average during the summer months, according to the study. 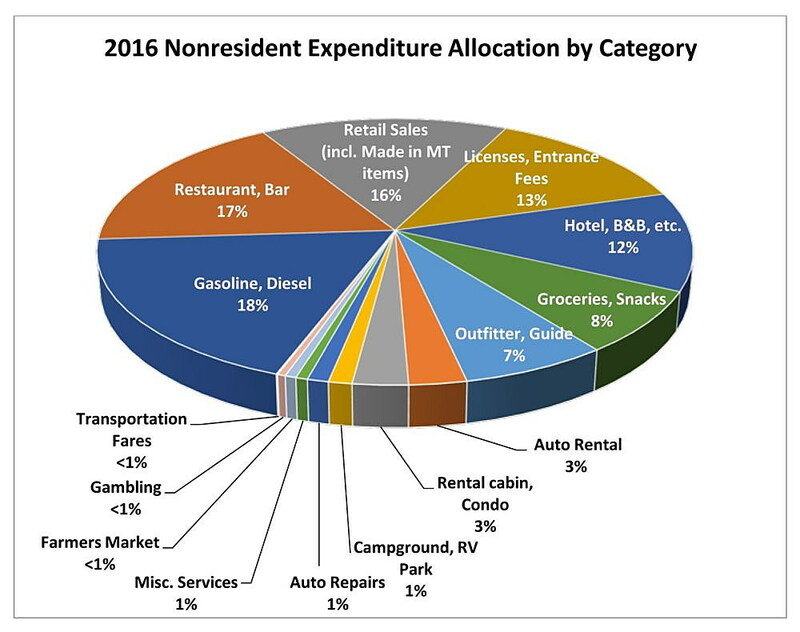 The report also found that 18 percent of visitor spending went to gasoline while 17 percent went to bars and restaurants. Retail sales, including Made in Montana products, racked in 16 percent of visitor spending, while entrance fees and licenses accounted for 13 percent. Hotels, groceries and guided trips accounted for 12, 9 and 7 percent respectively. Grau said visitation was up 5 percent in 2016, with 12.4 million travelers visiting the state during the year. 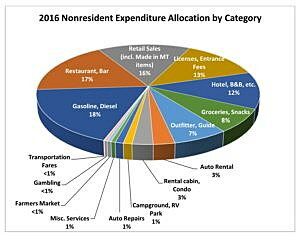 Overall, nonresident travelers spent a total of $3.5 billion in Montana last year, which was down 5 percent from the prior year.